I wanted to share some thoughts that I recently shared with our worship team at this week’s rehearsal from Nehemiah. 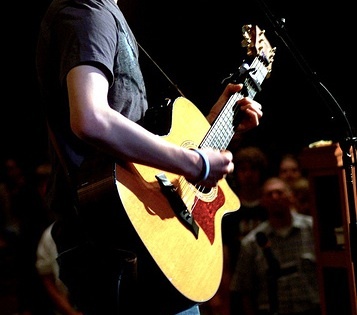 Did you know that Worship Leaders are in the Bible? Look at Nehemiah 12 – the Jewish nation is rebuilding the temple, and hey…what is a construction project without music? 🙂 Neh 12:2 says that the Levites were in charge of the songs of thanksgiving. and later in 12:46 there is a reference to “long ago in the days of David and Asaph there we directors of the singers, and there were songs of praise and thanksgiving to God.” We see that we have a “point person” that is responsible for the musical worship. That’s good organization, that’s why we continue to do that today. Our god is a God of order, not of chaos. (1 Cor 14:33) – we see Biblical support for organization and procedures in the musical worship of our God. We want to do all things to the best of our ability and effort for God. We aren’t earning favor with him, but our aim is to not be a distraction for others. Few things in life are as much of a turn off as someone who is half-heartedly doing whatever they seem to be doing. One of the things that struck me the most when I started going to church again about 10 years ago was the passion-less worship. I recall sitting in the back listening to a congregation sing “Our God…is an awesome God…” like they didn’t believe a word of it, nor cared. It left a very negative impression on me a new believer that these folks must not really believe what they are singing, as their outward passion (or lack there of) was in direct opposition to the words they were singing or the “awesome” God they were supposedly singing to. God wants our whole hearts. The Bible calls us to examine our hearts and test our ways (Lam 3:40). As we cannot truly know our hearts, (Jer 17:9)we are to ask God to search our hearts and see if there be any wicked way in us. (Ps 139:24). In our Nehemiah text, we see in 12:30 that the Levites ‘purified themselves.’ Yes, this is talking about ceremonial/ritual purification – but in the New Covenant (Heb 8, Jeremiah 31, John 4:21-26) it is no longer outward purification and ritual – it is within our hearts. We must spend time before leading others in worship to draw near to God ourselves in our hearts, have him search our hearts, confess, repent, and bask in the forgiveness and grace of Jesus. …it should be culturally relevant. This is still one of the biggest misunderstandings in the church today. Every place/people group on this Earth has a culture. Churches are no different. Your church culture is a reflection of the people that make it up. In our church, we have a wide variety of tastes, preferences, and personal convictions. We must weed thru them and separate the things of first importance from those of secondary importance. The first importance things are things like Jesus is God, the Bible is inerrant, God is creator, God’s redemptive plan thru the gospel of Jesus, etc. The secondary things are very culturally influenced – do we wear a tie or jeans? Do we play drums or the organ? Do we sing 16th century hymns with a piano or today’s songs with a full band? (the answer to all of those questions is YES, by the way…)– BUT here is the point — when we confuse the secondary stuff to be primary stuff – we take our eyes of Jesus and put them onto ourselves. We elevate our personal preferences too high. Nehemiah 12:27 says that they used the instruments available in that culture – their voices, cymbals, harps, and lyres. If they had electric guitars and drums they would have used them too, but they sadly hadn’t been invented yet. Music is a reflection of culture. We wouldn’t go deep into the jungle of Africa and play Chris Tomlin songs – that’s a cultural mismatch…nor would I have an all hip-hop worship set at our church – although it is appropriate elsewhere in other bodies with that cultural make up. When we don’t align the music of the culture with our church body culture we set up cultural barriers and negatively effect the message of the songs themselves – which is hopefully what is of first importance — the Gospel of Jesus Christ and the Word of God! For 89% of us in churches in the US – we need to have a careful and sensitive eye to the balance of our music at our churches, thinking of others as more significant then ourselves (Phil 2:1-11). Let us continue to search the Word of God and ask the Holy Spirit to cause us to understand it more as we apply it in the leading of worship to our great God!